Ever since my sister got her very spoilt dog a waffle maker for christmas (crazy, I know). And although Ebony, the dog, loves waffles she’s not too good at cooking them. So, since then, I have been searching for the perfect waffle recipe. After many failed attempts (too crispy, too soft, doughy or dry), I have finally found a fail proof recipe that is SO delicious! 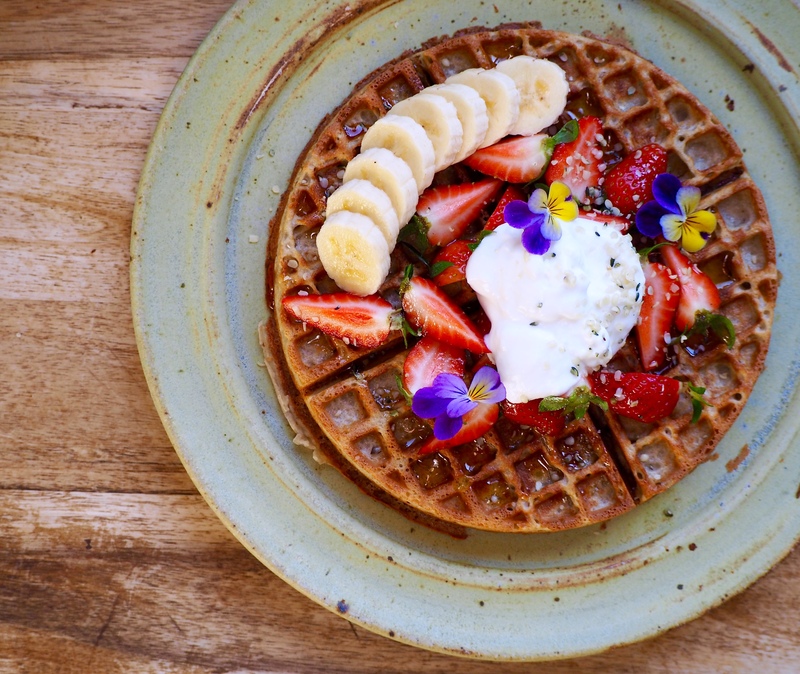 The coconut kefir acts like a raising agent, with its natural bacteria, and produces fluffy on the inside and crispy on the outside waffles. 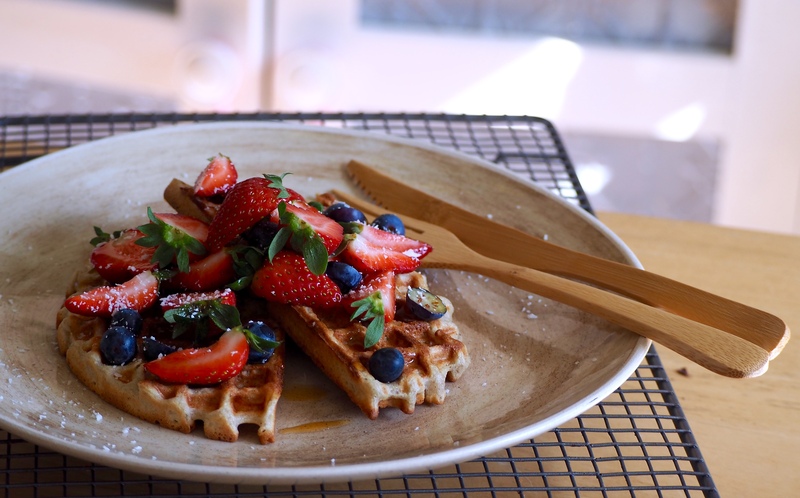 These waffles have become a favourite breakfast of mine that is perfect for the weekend and mid-week too due to their simplicity. 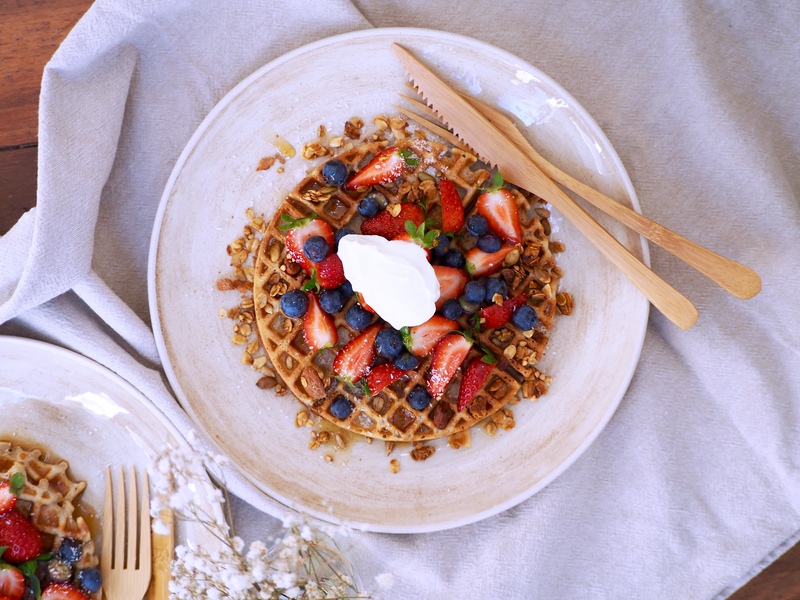 Soaking the oats overnight means all you have to do in the morning is blend and let the waffle maker do its magic! I have been making my own coconut kefir over the last month, i simple combine kefir grains with coconut milk and sit it a room temp for around 36 hours. I then shake it up and store it in the fridge for up to 1 week. It’s also delicious with granola and in smoothies. Start this recipe the night before by soaking your buckwheat and millet in a large bowl covered generously with filtered water. I always add a squeeze of lemon or apple cider vinegar too when soaking grains. In the morning rinse your grains well and place in a high-speed blender with the coconut kefir, banana, vanilla and cinnamon. Blend on high for 1 minute or until a completely smooth and creamy texture. Set aside for around 5 minutes. Meanwhile, heat your waffle iron to the desired setting, I like to have mine of the 2nd highest function for a nice, crispy outside. When heated, pour in approximately 1/3 C of the batter. Close and let the waffle maker do its thang. While the waffles are cooking prepare your desired toppings. If you are cooking for a crowd keep the cooked waffles, covered with a tea towel, in a 150 degrees celcius oven. However, these are best served hot off the waffle maker!